All the colors in the rainbow, complimented with grosgrain ribbon on the front and ties at the shoulders. 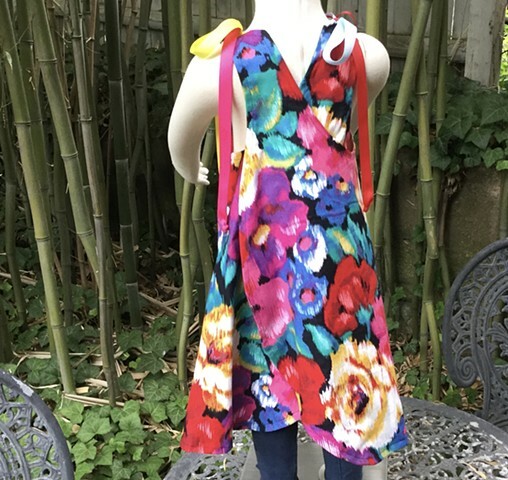 Sized for K-1st Grade (5-6 years), measures 24” armpit to armpit, 24” shoulder to hem. Roomy skirt overlaps in curved panels in the back, goes on over the head, but can be opened at shoulders for easier access. Ample pockets, deep inverted box pleat in the front for extra room. $100, new 100% cotton pre-washed fabric, made by the designer herself and shipped free to any address in the U.S. #237.